Reflection – Reviving a Dinosaur? Home/Essays/Reflection – Reviving a Dinosaur? I am not a historian. Who knows how most people lived and thought in the privacy of their home before the age of Facebook. Through Facebook I am told that a vague acquaintance of mine just made a bean soup, and the notification is accompanied by a picture of said soup. Another one informs me of someone using a new deodorant, and why this seems to be a life-changing event. A third one shows off their new dog, obviously soaking in the accolades of friends expressing their admirations. Really? Should I care about soups, deodorants, pets and whatever else the kitchen sink can swallow in other people’s homes? I actually am interested, although unlikely for the reason you may think. I am fascinated by how social media like Facebook reflect the workings of the human mind. I am no exception – my own day is full of Facebookisms: Like that cheese? Love this new pillow! This peach is so smooth! Trying a new toothpaste. Tired of this old bike – want a new electrical one. Did you hear about aunt Polly buying a new Volkswagen? … The ongoing daily chatter expressing some sort of sentiment or emotion disguised by a sea of irrelevant gossip, as we connect with one another in mysterious ways. Trouble is, this sea of communication is more like a vast desert of irrelevant soundbites, leaving me terribly thirsty for a different style of human interaction I always imagined to be more prevalent ‘in the good old days’. If only these Facebookisms were just small talk, but I suspect them to be more sinister than that. They don’t seem like light-hearted reprieves between deep moments of connection, but more like desperate expressions of rigid narcissistic minds that have lost access to something deeper. I come to realize that the good old days were likely not much better than the bad new days, just different. Now I wonder, and doubt that it was ever much different between people – today we just have more direct insight into each other’s bedrooms. The deeper style of relating I am referring to is reflection, which in turn is directly connected to how we use thought, emotion and language. To understand reflection we need to examine the ways we share our stories. Our stories take different forms. We have the everyday chatter, which is a free associative process by which we voice whatever seems most salient in the stream of our consciousness. Then there is linear, logic language like the descriptive language of science that describes concrete reality, or the conceptual language I am using now for this essay, developing abstract concepts. The metaphorical language of literature (both prose and poetry) and spiritual wisdom texts, is not linear and logical, but holistic and intuitive. These language modes are based in how our right and left brains collaborate: While our right brains directly present reality to us in the form of metaphor like a waiter serves us a nourishing dish, the left brain re-presents reality in the form of logic like a waiter giving us the menu about available dishes. This is the reason why, like the menu, logic alone never fills our tummies. Only when we are connected to the right brain’s messages are we really alive. The work in mindfulness consists in exactly that re-connection with the right brain. Over the course of human evolution we also developed progressively more complex ways of thinking and using language. Yuval Harari points to the cognitive revolution that unfolded somewhere between 70,000 and 30,000 years ago (Sapiens, A Brief History of Mankind, p. 21), during which we may have progressed as follows: First we talked about things that existed in the concrete world – coming home from a hunt the hunter may have warned his tribe not to go to the river bend below the cliff, because he spotted a tiger roaming there. As our thinking became more complex, we started to gossip, talking about other people’s minds – we would discuss why the husband of our best friend would have an affair with a next door neighbor and what could be done about it. Finally, and that was the decisive step towards becoming the earth’s dominant species, we began to talk about things that don’t exist, such as the notion of freedom, equality, God or mathematics, giving rise to large systems of imagined orders that organize human societies. If you consider for a moment that the cell phone and computer were all implicitly in existence during the stone ages, just still buried under the fog of unevolved imagination, you get a sense of what incredible power the human imagination has. It is becoming quite obvious, how versatile our capacity to use cognition and language is. These different ways of thinking require many different parts of the brain to be engaged. All together, the versatility with which we are able to freely roam these language scapes is precisely what makes us human and gives us untold powers we can use for construction and destruction. 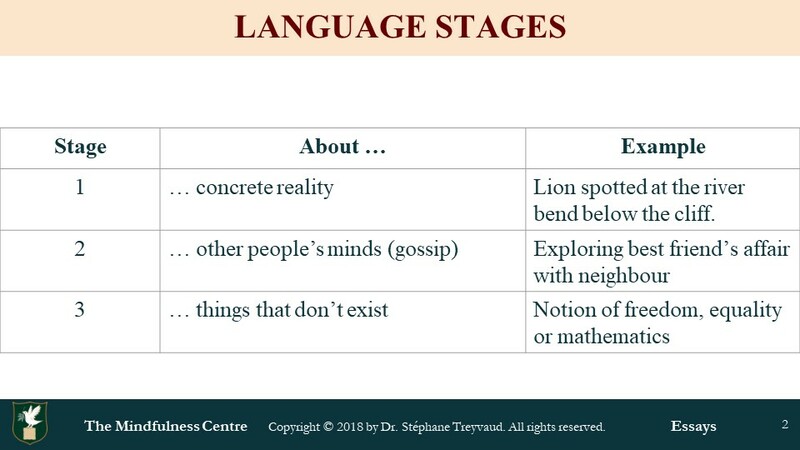 However, what I seem to notice is that as a matter of course, on a day-to-day basis many people live a linguistically, and therefore cognitively impoverished life by not having access to or not using these different language aspects. This brings me right back to Facebookism, to a culture in which people connect through rather meaningless soundbites devoid of deeper and more extensive cognitive and emotional elaboration. This brings me to reflection, a very distinct function of our minds that has its equally distinct neurocorrelates. Reflection is a function of the middle prefrontal cortex (MPC), from an evolutionary perspective the latest and uniquely human part of the brain. 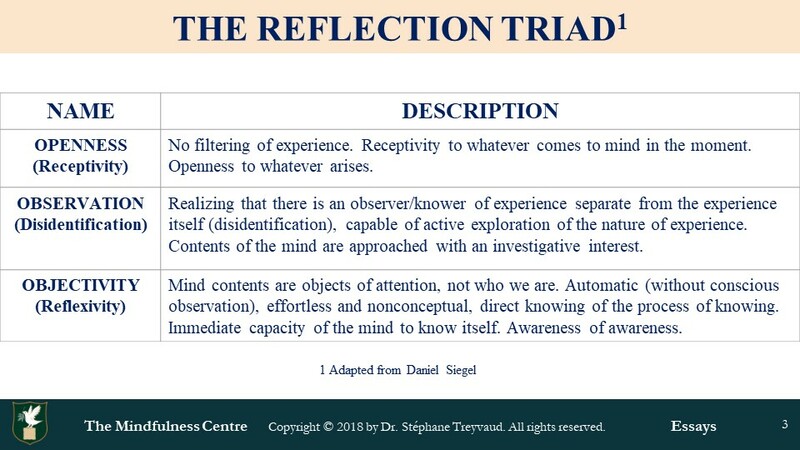 Reflection is at the heart of mindfulness and refers to a way of paying attention that goes beyond concentration, is not routinely available unless we train ourselves to access it, and entails three aspects. These are (1) openness to whatever arises in consciousness, (2) observation of experience with an investigative interest as being different from the observer and who we are, and (3) objectivity, the mind’s capacity to automatically, effortlessly and nonconceptually know itself in the form of awareness of awareness. Putting reflection at the core of human communication is not an easy task and is a very complex mind activity that requires education and training. It requires the development of mindfulness and mindsight, the ability to see the mind of others and our own mind clearly, then integrate the two. 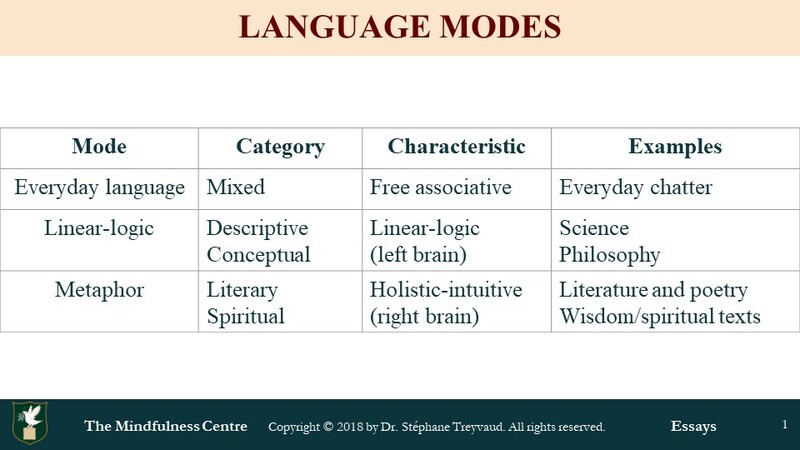 With reflection comes the flexibility to roam all three language modes, five language categories (Fig 1), and three language stages (Fig 2). Observe people’s main communication patterns and you will quickly realize that many are stuck in concrete thought patterns and gossip, or everyday associative language, without access to other language modes. This conceptual and linguistic impoverishment reduces the depth and vibrancy with which we live life and eventually leads to destructive social trends. Without being able to expand on that in this context, the very survival of liberal democracy is at stake. The authoritarian political trends of our time are directly related to the impoverishment of our thought and language modes. When we have never been taught or even lose the ability to reflect, our sense of clarity regarding how we see reality diminishes. With it comes an inability to access truth’s complexity, compensated by clinging to lies and fake news that falsely seem to ring true. We then become victims of the power of false convictions, which belie strength, when in fact the resulting low selfesteem cannot be hidden. To compensate for these deeper insecurities we project our strength on autocratic, tyrannical leadership that undermines all decency and sense of moral orientation. What does reflection subjectively feel like? It is inherently about a deep relationship, both to another person as well as yourself. The playful openness to all possibilities of imagination is palpable. You sense your body and the inner life of the other person. Unlike most conversations you may pick up around you, reflection reveals the complexity of the dialogue’s content. It feels like you are in a dance with your partner and no one needs to have the upper hand. Argument is of little interest as it is replaced by expansive creativity in thought generation. There is a rhythm to it with breathing spaces for silent contemplation of what is said, and attuned exchanges of ideas. The sense that nobody has the truth is strong, and with it comes a relaxed feeling of not needing to convince your partner of anything. On the contrary, there is a joining in the common cause of exploring the fabric of truth as far as it can possibly go. You are invited to feel vulnerable and freely switch from one language mode to the other. You cannot possibly take your thoughts and beliefs as the truth and are able to realize that your experiences are neither you, nor reality. Like a mirror, reflection reflects you back to yourself and the other person back to you, and the process is mutual. Through the dialogue with another person or yourself you become your best possible you, in all your fluid complexities that never cease to evolve and transform. Reflection is the only act of mind that can save humanity from tragedy, and yet, it is sad to say, there is little evidence for it happening on anything more than the small scale of pockets of sanity here and there, dispersed in the jungle of frantic mindless survival. Even with your closest loved ones it is not easy to come by.